My friend Serene posted a mouthwatering photo of Thai Noodle Soup and it looked so good I had to try the recipe myself. It calls for Thai shrimp paste (belachan), which meant a trip to one of San Diego’s many Asian grocers. We made the soup with the stuff on the right. It was great (thanks Serene!). Like fish sauce, it adds a wonderful earthy richness when it’s cooked in the soup. The other stuff seems a bit more like a condiment or stir-fry sauce – it’s still got a strong shrimpy aroma, but nothing like the gut-wrenching power of plain shrimp paste (the recipe calls for “a pea-sized piece”). From what I can tell (from Wikipedia and other sites), the dried block and the “shrimp sauce” on the right are pretty much the same stuff, with the difference that the block is sun-dried before packaging. Results in a slightly different flavor, but in the same ballpark. We couldn’t find any of the blocks at the two stores we tried. Shrimp paste comes in block form and it’s a dark (almost black) color, and very “stinky”. To make shrimp paste now, only tiny plankton shrimp are used, and the process starts when the shrimp are freshly caught. The shrimp are mixed with salt, put in a tank and left to sit for 2 days. Then the mixture is put under sunlight for a day or two, pounded up and pulverized, and put back in a tank to ferment for 6 months. 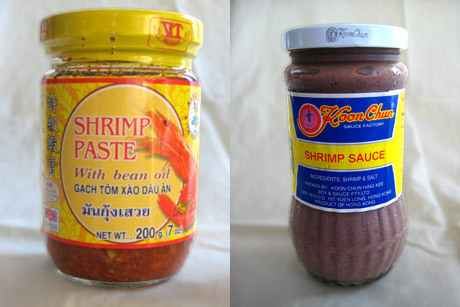 Here is a link to shrimp paste info & photos as well.